When all this loses its charm and the guests of the hotels demand a new diver­sion, the host suggests, in desperation, that they "go to Grasse," and so their angry-red motor car comes shrieking up the hillside road from Cannes, stops for a few moments in front of the exquisite showrooms of the Parfumerie or Con­fiserie, and then goes racing down to Nice on the other side that not more than one afternoon may be lost from the gay world below. " Grasse must seem love1y even to these motor tourists who have such a fleeting glimpse of sunny gardens, terraced or­chards, and the dark narrow streets of the quaint old town. One must linger here to watch spring pass into summer to realize that this is the garden of the world. 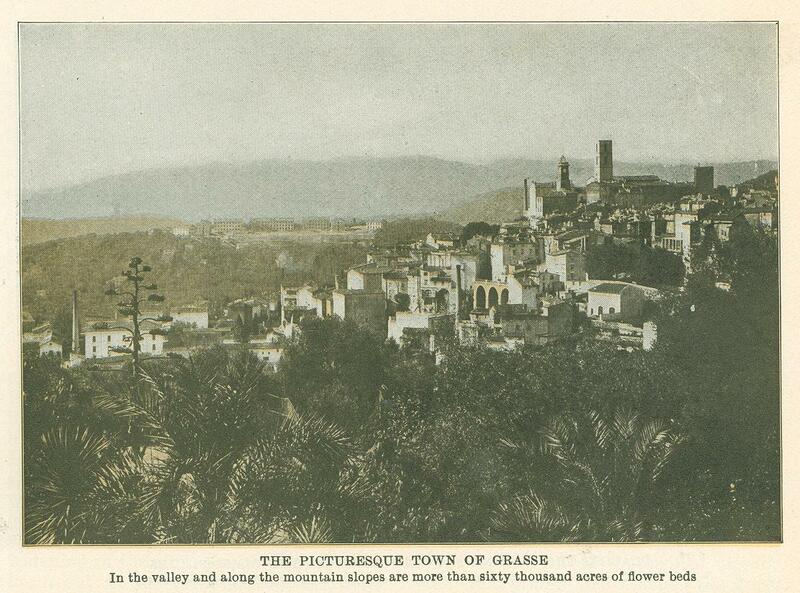 The guidebook describes Grasse in rather commonplace terms, though the town is anything but commonplace. The attractions offered by that book might not persuade the hurried tourist to leave the beaten track for this mountain resort famous for its "delicious water" and a "climate suitable for nervous tempera­ments. " The further information is sup­plied that "it is an inland town of some fifteen thousand people, named probably for its founder, Crassus. Near the sum­mit of the mountainside on which it is built, Napoleon rested on his way from Elba. Here in Grasse, Queen Victoria spent part of the winter of 1891. The chief industries of the place are the mak­ing "of perfumery and glace fruit. Nearly all of the perfume of the world is ex­ported from this center, yielding to the factories an income of a million and a half yearly." It was no historical pilgrimage that led us to Grasse in order that we might follow in the footsteps of Crassus, or Napoleon, or Queen Victoria. 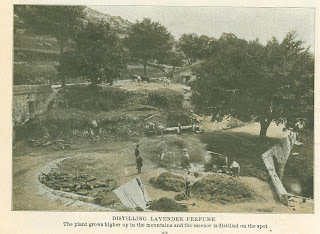 We were not thirst­ing for "delicious water," nor seeking to soothe a "nervous temperament"; but the industries of the place interested us exceedingly, so we decided to take up our abode on the side of the mountain, Roca­vignon, where Napoleon and our motor friends had lingered so short a time. The train climbs slowly the twelve miles from Cannes to Grasse and stops frequently at the little stations along the way where one looks down upon terraced gardens. There are more than sixty thousand acres of flower-beds in the val­ley and along the mountain slopes. Ev­ery available bit of ground where there is room for a plant to strike root has been walled in, and the cassia, or rosebush, has to pay its yearly tribute of fragrance in return for the care lavished upon it. Here and there the flowers run riot, but usually tiny irrigating ditches separate the neat even rows of violets, jonquils, jasmine, tuberoses, heliotrope, roses and lavender. From the station the steep ascent con­tinues by carriage road or granite steps, for the hotels of Grasse are perched, like medieval castles, near the mountain's summit. 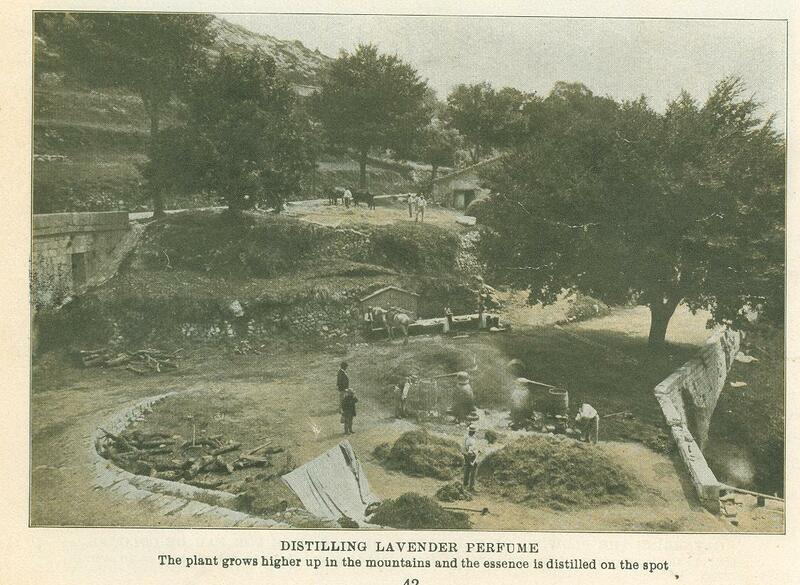 One breathes a new atmosphere here; it is as though the invigorating mountain air had been sprayed with eau de cologne. 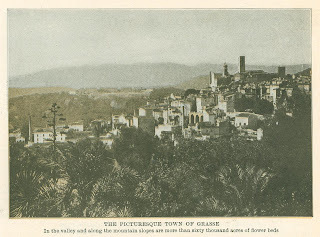 The factories in the valley are continually distilling orange blos­soms, for this flower is available at all seasons, and it is the petal of the bitter orange- that yields this delicious, fra­grance. In early March we found spring well advanced, and mingled with the per­fume of the blossoms of the bitter orange came the odor of almond blossoms, acacia and violet. gather; some are very diminutive, but they smile back at one with their spark­ling black eyes as though this soaping and pounding of clothes and visiting with neighbors were a holiday pleasure and not a task. In summer and at harvest time, the children, as well as the women, young and old, find a more. delightful occupation in the fields. In peasant caps, or wide ­brimmed hats, one sees them with baskets beside them gathering violets under the shade of the woodland trees, or out on the sunny terraces filling their aprons with tuberoses or cassia buds. Such baskets full of flowers we saw brought in and heaped up on the floors before us, each short stemmed blossom perfectly fresh and fragrant. 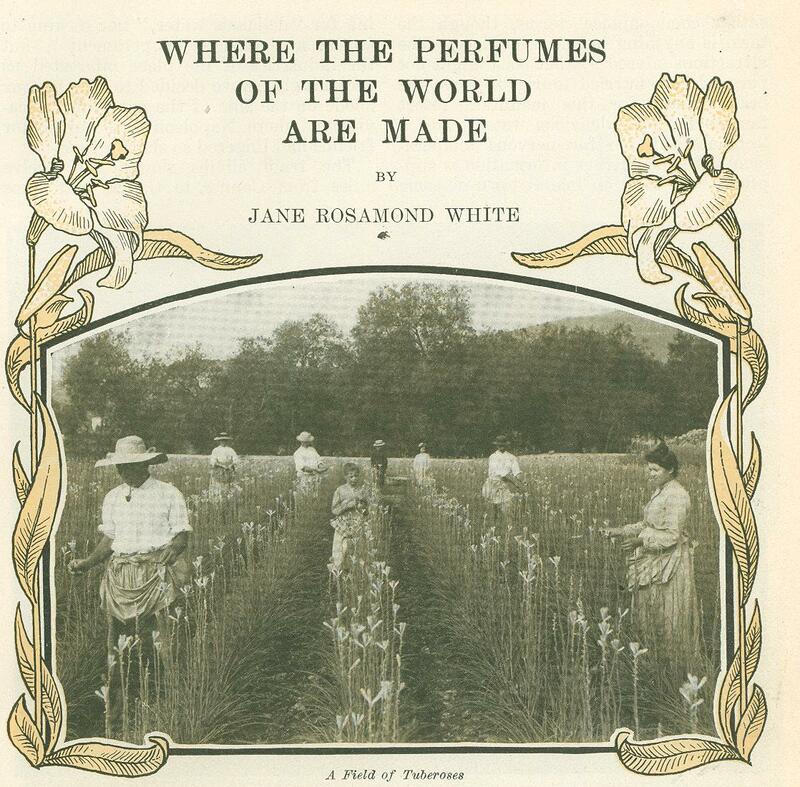 The process of manufacture is much the same for all perfumes except those made from rose or orange petals. Glass sheets, held by frames a few inches apart, are smeared rather thickly with lard, and between these sheets the freshly picked blossoms are scattered, touching the frames but not being pressed by them. In one day the oil of the flowers exudes, and the lard absorbs the precious drops. Before the grease is fully saturated the flowers are changed many times, the num­ber depending upon the amount of oil the flowers contain. If the flowers are plentiful they may be changed as often as every six hours, and in the case of jon­quils thirty times; jasmine is usually changed eighty times before the layers of lard are entirely saturated. We had before seen this affinity of things unlike. In the diamond mines of Kimberley the bits of garnet, quartz crys­tal, and diamond come tumbling out of the blue soil and are washed along until they come to the grease covered plates; where the diamonds cling with as much tenacity as do the heavy drops of violet oil. The fragrance of the flowers and the sparkle of the diamond could not be so easily taken captive without the humble contribution to the world's industries offered, however unwillingly, by the ani­mal called unclean. When the lard has absorbed as much oil as possible from the flowers, it is melted and dissolved in purified alcohol made from grain. We watched the great oily drops which had combined with the alcohol slowly rise to the top of' the large iron pot, floating there in yellowish and greenish globules. When this mixture is filtered, the concentrated extract may be re-dissolved in spirits, diluted, or mixed with other oils according to the strength or quality desired. Attar of roses and neroly, the base of eau de cologne, are made by a different method. The perfume may be extracted by an ordinary process of distillation if a very even heat is maintained, but the usual method is the bain-marie. A large kettle of lard is immersed in a tub of water at the boiling point until the grease reaches a uniform temperature and is entirely melted. Into this warm lard the petals of orange blossoms or of roses are thrown. It is the bitter orange whose flowers are valued especially, and for attar of roses a pale red, intensely fra­grant rose is most prized. The petals re­main a day or less in this bath, and then the inodorous wilted flowers are removed and fresh ones submerged until the mix­ture attains the desired strength. The women beat the mixture into a cream and the bain-marie room looks much like cake making on a large scale. To bend over the different deep bowls is to inhale the concentrated fragrance of fields of roses and groves of oranges. After the pomade is made, the oil may be shipped in this state, or distilled and sold in its concen­trated form as attar of roses or neroly, or diluted to the strength of "perfume" or eau de cologne. Twenty thousand pounds of rose petals are required to make one pound of attar of roses, valued at about $200. A thou­sand pounds approximately of the petals of the flower of the bitter orange are necessary to make a pound of neroly, val­ued at $20 on an average. When neroly is distilled the water is saved and served in the cafes to the ini­tiated. We learned to sprinkle per­fumery into our tea, and to enjoy eating and drinking flowers in every form, for in the Confiserie violets and rose petals are candied, and orange petals are trans­formed into bonbons, or the still more precious orange tea. At the foot of the Rue des Cordeliers is the interesting Confiserie, where one may inspect the entire circuit of work­rooms and watch the preserving of fruits in every form. Here are made the ordi­nary jellies; jams and preserves; com­potes, with the whole fruit in syrup; and candied fruit with either a glazed or crystallized coating of sugar. 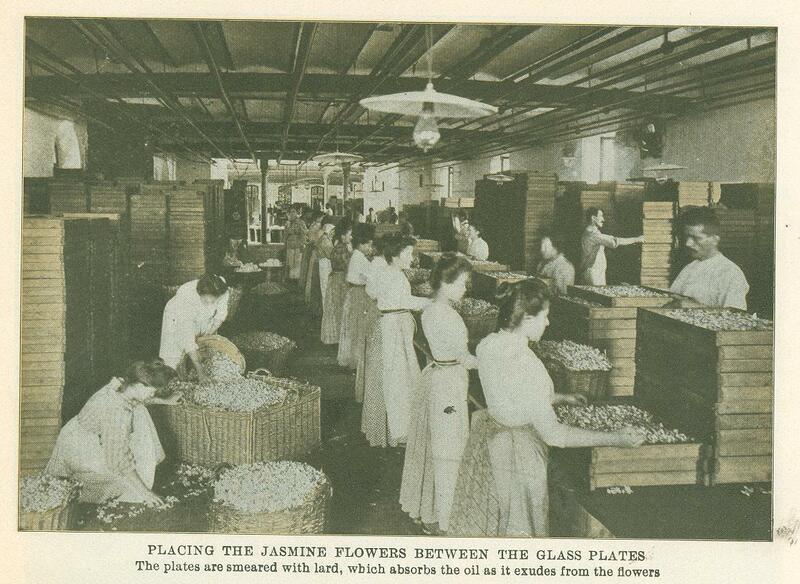 The women sit near the windows with a truly tempting display of work before them. Transparent red cherries and strawberries are being sorted and packed in one room. In the next, violets are be­ing dusted with a coating of finely pow­dered purple sugar as they come from their bath in hot syrup, prefatory to another glazing. Near the door the men are emptying baskets of perfect double ­blue violets, short stemmed and fragrant, too lovely, it seems, to convert into even the daintiest morsel of food. 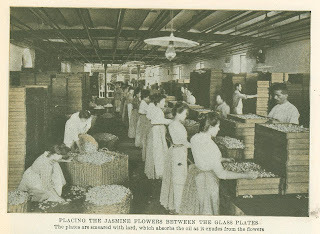 Hundreds of yellow porcelain bowls are piled in tiers in the larger rooms. It. is the season for limes and little Man­darin oranges, and they are taking a two. months bath in syrups that are changing them into transparent green, red, and yellow globes. Old women sit near heaps of oranges, patiently pricking them with an orange-wood stiletto, which is neces­sary before immersing them in limewater. In South Africa, where fruit is so abundant and delicious, the Dutch house­wives have learned the secret of making these crystalline confections. They trans­form everything from green figs to tur­nips into a "confait" for which they are famous. But it takes the patience of the Dutch, or at least more patience than the ordinary American possesses, to change liquids and syrups the number of weeks necessary to perfect this transparent "sweet." One may visit in Grasse only the con­fectioners and perfumers who have retail rooms and who conduct business on a somewhat limited scale. The largest fac­tories are closely walled in; the con­cierge forbids entrance at the gate, for the important work within is not to be interrupted or disturbed. It is in these wholesale manufactories that the per­fumes are made that supply the market of almost the entire world. 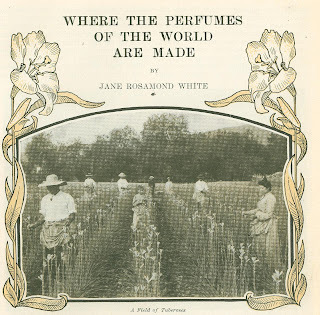 London and Paris perfumers add their own labels to the extracts shipped from Grasse, dilut­ing them, or making any combinations they choose. One does not need to question for whom this refinement of luxury is being prepared. Purchasers from the gay Riviera resorts come to the factory doors, and carry away from the show-rooms quarts of perfume and pounds of can­died fruits. We watched the interesting procession as it passed in and out from motor cars and carriages to the reception rooms of the Parfumerie. Every language is spoken by the company of exquisite creatures in furs and soft chiffon veils, who pass along the tables to test the great bottles of perfume placed there, with atomizers attached, as samples of the dozens of different odors. The elegant rooms, with velvet curtains drawn, where a hundred electric lights add to the bril­liancy of cut glass bottles and sparkling liquids, is none too fine a setting for the wealth and beauty of the world that dur­ing the months we call winter, seek this azure side of the Mediterranean. The men contribute their part to the interest­ing scene by the unobtrusive and seem­ingly grateful part they play in being allowed to hand out many crumpled bills and to store away in the depths of the carriages perfumes, scented face pow­ders, soaps and silk sachets. The day's shopping is completed when handsome baskets and boxes of glace fruits from the Confiserie have been purchased. After all, the path money travels from the purses of the rich to the pockets of the poor is a fairly direct one. It is the life of luxury and its demands that make possible this prosperous peasantry of Grasse, with its picturesque life. Originally published in The World To-Day Magazine. January 1908.